Big, bold and expensive, but if you want the best, look no further. Sounds incredible. Excellent build quality. Very tactile long throw faders. The (whopping) price means this is only for serious sound hounds. SPL has a very wide range of excellent audio processors, but the 120V technology which powers the Neos has, until now, only been available in its excellent Phonitor headphone amplifier and in its range of excellent mastering consoles found in many top mastering studios worldwide. 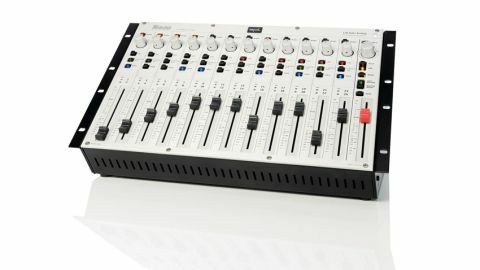 "With its simple looks and excellent build quality The Neos feels substantial"
The Neos consists of a rackmountable 24-channel summing mixer with a solid separate power supply. With its simple looks and excellent build quality it feels substantial. The knobs and switches are very positive in operation and the faders are wonderfully smooth through their whole travel. So what does it do? The 24 channels are arranged as 12 stereo channels bussed to a stereo output and a monitor section that controls two sets of stereo speakers. There's a dedicated long-throw fader for each stereo channel and a master fader for the stereo output. Starting from the top, each channel has a mono button which sums the stereo input to mono. ￼￼￼ Below that comes a pan pot which has a very obvious centre ident; a cut switch which mutes the signal to the stereo output; a To Monitor Only switch which, when used in conjunction with the Cut switch, routes the channel only to the monitor path disabling it from the stereo output; and then a latching Solo switch which is a PFL (so it monos the signal directly to the monitor path). The monitor section has a Mon B switch to swap between speaker sends, a large continuous Level pot, monitor mute, dim (-20dB) and mono switches. Below these are switches for tape return (to monitor a recorded mix), a master insert to switch in and out any external processing on the master output and Bend. This switches in a multi-stage passive diode limiter that is intended as a kind of peak limit protection circuit. All the connections are on the back panel - channel inputs are handled by three 25-pin D-Sub (Tascam protocol) connectors: a wise choice as they're a well-established professional connector and good quality cable looms are readily available at reasonable prices. All stereo ins and outs are on XLRs, again a good choice as most buyers will be using a unit of this quality to connect to other XLR-based systems. Here you have a main Stereo output (the recording out), a tape return input (for monitoring playback of recorded mixes or another external source), two sets of loudspeaker outs and a stereo insert send/return for the master buss. These are all balanced connections. Further to that are two other unbalanced outs intended to feed stereo metering and a headphone amp. Finally, there's the massive 14-pin connector for the power supply and a pair of five-pin XLRs which allow you to connect another Neos in a chain. Everything is well labelled and easily accessible, so getting connected is very straightforward, exactly as it should be. We first tested the Neos as a straight summing mixer. When we reviewed the SPL Mixdream for our summing mixer feature (FM224) it came out on top for sheer clarity and depth - and that's based on their 60V technology. The Neos works at double that, so we had very high expectations. All our tests were made using identical converter chains both in and out. The test was very simple: each of our three test tracks was balanced (balances of the raw sounds) 'in the box' and then broken out into stereo stems and recorded back into the DAW summed through the Neos. Balances were identical and we did no external processing or internal mastering. The final files were simply peak level matched for a simple comparison. "The results, though subtle, are impressive - the best word to describe them would be 'refined'"
The results, although subtle, are impressive. The Neos gives an overall increase in depth and stereo image and the 'blend' of the instruments feels more natural and coherent. If we had to use just one word to describe the results it would be 'refined'. It's particularly obvious on our acoustic track. This recording was unusual in that it was done with a Calrec Soundfield microphone left in a fixed position in the studio. All the instruments were recorded separately and their stereo placement is entirely due to seating position. However, the summed version of the mix really does get you closer to the concept of making one musician playing six instruments sound like a six-piece band around one mic. In the other two tracks the big difference was in how the sounds blended together, the summed versions sounded far more cohesive. If this is your starting point in a mix, then getting to the end result is going to be simpler, a darn sight faster and most probably better than what you could achieve just bouncing out your stereo output. Because the Neos has faders, you could do a bit of manual mixing on it. It's particularly tempting as the faders are long throw and feel great in use. This works great until you get to the moment when you need to put down a 'no vocal' version or bounce out some stems. Muting the vocal is simple but we often use that as the audio cue for all our fader moves so SPL have included the option of being able to send a channel exclusively to the monitors by using the 'To Monitor Only' button and the mute switch. This allows you to hear the muted track in the mix but it doesn't go to the record output. Very useful for those of us who like to push those faders. One word of warning though, if you don't have a mix set up with unity gain through the system (all faders at zero), then you'll need to level-match the monitor-only channel back into the mix. Once you get your head around that detail it becomes a very useful function. The other feature is 'Bend'. This is a limiter circuit that sits over the master output post the master fader. It's a diode-based limiter aimed at removing peaks, which it does very successfully when used subtly. The only problem is that there's no threshold control so if you engage it you have to be very careful how much level you push through it: when pushed harder it's intended to saturate and it certainly does. "When a manufacturer comes up with a device like the Neos, you see how much further digital has to go"
Being post the master fader, it prevented getting high enough recording levels in our test system without pushing it harder than we wanted to. SPL intend it to be more of an effect than a dedicated limiter so use it with caution. It's not intended to be a replacement for a mastering limiter, that's why they provide an insert point on the master fader. SPL's other, and up until now flagship, summing amp has been the Mixdream. This is a 16-channel summer with individual channel inserts, switchable transformer stages and stereo width controls. We asked SPL chief Hermann Gier why some of these features hadn't been included in the Neos, which is three times the price of the Mixdream. "The 120V system is something we've developed over the past 12 years. Every OP amp is hand-built using the best possible components and, in order to maintain the integrity of the system, everything in the Neos - including the monitor section - has to use these OP amps. Just the addition of individual channel inserts would involve a huge amount more of them, increasing the size and power consumption of the Neos massively - as well as the price. "It's a simple matter to build a patchbay which sits before the Neos Channel inputs, so inserts could very simply be made there. The inclusion of the master insert means that it's very easy to A/B any final stereo processing and, for the majority of users, that's the most important point. We're very confident that the sonic performance of the Neos will impress enough that it will find a group of dedicated users. We see this as the beginning of a range of recording products based around this technology, and we're very excited to see what the future will bring." We can only agree. At a time when a lot of recording engineers are complaining about the dumbing down of audio quality, the Neos casts a very long shadow. It's not cheap but then true quality and innovation very rarely are. The Neos can make music sound better - and that's priceless.